5 Things To Know For The U.S. Vs. Belgium Game : The Two-Way Two key questions are whether the U.S. can strike early, as it did against Ghana, and whether Belgium can pull away late, as it has in all its games so far in Brazil. The return of U.S. striker Jozy Altidore, who had been sidelined by a hamstring injury, could help the Americans as they face off against a talented and young Belgian team Tuesday. Today, players and fans of the U.S. and Belgium are building toward a decisive game that will send one team to the World Cup's quarterfinals and send the other packing. Two key questions are whether the U.S. can strike early, as it did against Ghana, and whether Belgium can pull away late, as it has in all its games so far in Brazil. Here are a few details that should help you watch the game, which starts at 4 p.m. ET and will air on ESPN and Univision. We'll also be live-blogging the game at The Two-Way. The Belgian roster is stocked with young talent; only one player is over 30 years old. Many are already recognized as elite players: The Red Devils' 23-man World Cup squad includes 12 players from the English Premier League, across every position. Prepare to hear these names a lot: midfielders Eden Hazard and Marouane Fellaini (he of the puffy hair), along with forward Kevin Mirallas and defender Vincent Kompany. While Kompany's status is a bit uncertain due to a groin injury, Hazard is widely seen as a star who has yet to put his mark on this tournament. And while the Belgian lineup is imposing, the U.S. has at least two fewer problems to worry about, due to the absences of Thomas Vermaelen (injury) and Steven Defour (red card). By contrast, the 23-man U.S. roster includes seven players who are over 30; four of them play in the English Premier League, and nine play for MLS teams, including team captain Clint Dempsey. Those differences qualify today's game as a good barometer of the Americans' ability to beat a strong European team — something they haven't done since overcoming Portugal in 2002. 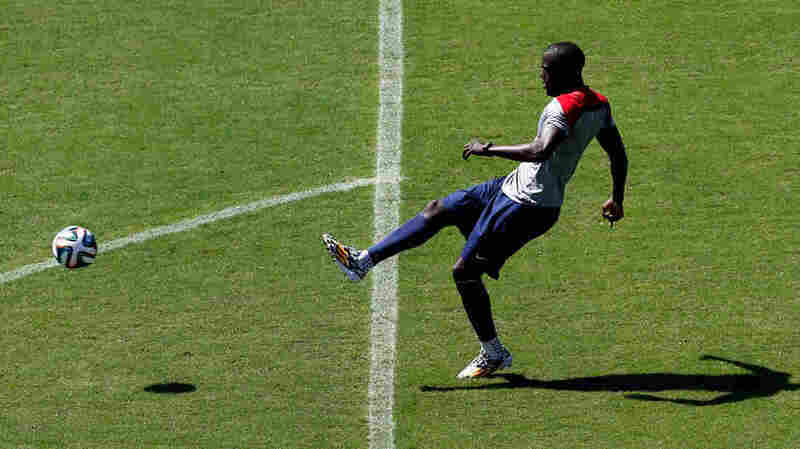 The game should bring the return of U.S. striker Jozy Altidore, who left the Americans' opening game with a hamstring injury. While it's possible Altidore will only play as a late replacement, the U.S. could need him: He's one of four Americans on the roster who've scored more than 10 goals during international play. When Altidore was out, the U.S. relied on a speedy and nimble defense, with Omar Gonzalez and DeAndre Yedlin both turning in strong performances, and DaMarcus Beasley roaming far upfield. Through it all, defender Jermaine Jones has been a stalwart. Both teams have several players who carrying yellow cards into today's game; four for Belgium and three for the U.S. (Jones, Gonzalez and Kyle Beckerman). U.S. fans have settled on the quietly hopeful "I believe that we will win," a rallying cry that's broken into a call-and-response that builds into a chant — before breaking back down into the inevitable "U-S-A! U-S-A! U-S-A!" Belgium's fans have several chants, starting with the repetitively simple "We love you Belgium" — a line that ends with "We do!" They also chant "When the Reds go marching in," to the tunes of the New Orleans jazz standard. Don't be surprised to hear the White Stripes' song "Seven Nation Army" sung by Belgian fans — as Deadspin reports, they (along with other Europeans) love it. "Tim Howard: The 6-foot-3 Everton keeper probably needs to have another big game for his team to advance. Howard is expected to make his eighth World Cup start for a U.S. goalkeeper record. He has been the Americans' main keeper since 2007 and is playing in his third World Cup. "Thibaut Courtois: The 6-6 keeper for Atletico Madrid is considered one of the world's best. He is the only goalkeeper to not allow a goal in Brazil during the run of play and earned his 101st shutout against Korea. Belgium has never lost in the 20 games in which Courtois has played." The U.S. has beaten Belgium in the World Cup before, but it was way back at the first tournament, held in 1930. Since then, the Red Devils have beaten the Americans several times, but never in the World Cup. Moving on to the quarterfinals would be a huge boost to both countries' programs. The U.S. last reached that stage in 2002. And while this is the second-straight Round of 16 appearance for the Americans, the Belgians haven't been this deep in the World Cup since 2002, when they were dismissed by Brazil. Belgium failed to qualify for the World Cup in both 2006 and 2010, but its current crop of young players has been widely praised.